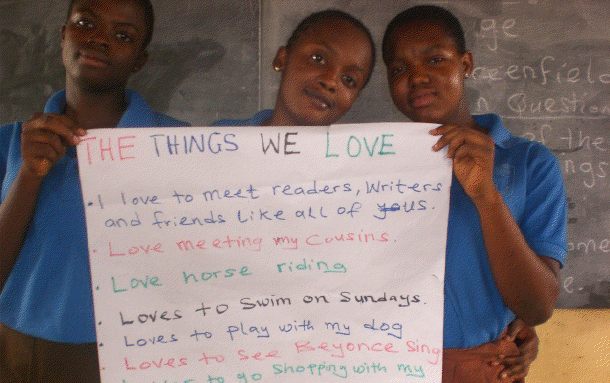 Girls in Accra, Ghana, Recognize that Kindness Creates Change. It was much joy meeting again as readers, writers and friends after a break that ushered us into a new year and a new school term. It was with much excitement that we said hello to each other as we welcomed one another to our day 7 meeting. Kindness was the strength around which our story for the day was shared. We shared a story by a local author entitled “Ama’s Concern” by Akua Tanefa. The story is about the love and concern of a little girl for trees in her community. She had learned in school that trees are life. Trees provide shelter, protect the environment, serve as wind breaks, and facilitates rainfall for the benefit of crops and plants. Ama began to complain to her parents and people around her about cutting trees for firewood and timber. She became sad anytime she saw trees being cut. Even though Ama’s concern has still not received attention in her community she continues to move the crusade against cutting trees and she hopes that one that one day the call will be responded to. The story was connected to Kindness as one of the Litworld Girl’s club strengths. The girls were led to acknowledge Ama’s tenderness towards trees in her community and her positive attitude of responding to an environmental cause. For our writing activity, images representing global issues were shared and discussed among girls. Girls were asked to choose one issue most important to them write down why the issue is important to them and how they can change the world to make it better. Very interesting write ups were shared by girls. 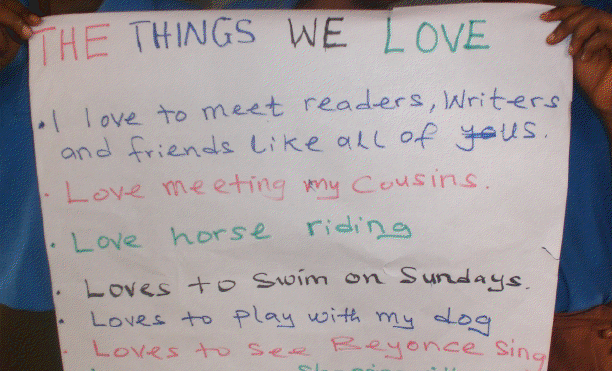 All responses were recorded on a chart paper and the list titled “What we care about”. Girls were then asked to write letters to the world, the president, the first lady, or anyone they would like, telling that person or global community what they feel is an important cause, what needs to be changed and how they think the change could be accomplished. Girls who have volunteered to have their letters share with the group have also volunteered to share their letters with the Girls Club Community. The meeting was wrapped up with a review of the day’s activities. I emphasized the need for the girls to continue to think about the world outside their neighborhood. The need for them to effect positive change, both in their communities and in the world was stressed. As we held hands and sang our farewell song together, I reminded girls of how we are all connected and a special community of women and girls. Thank you for instilling lessons in kindness and changemaking in these young women, Emefa. We love hearing and sharing your stories! For our special activity, we decided to connect with the community market women. 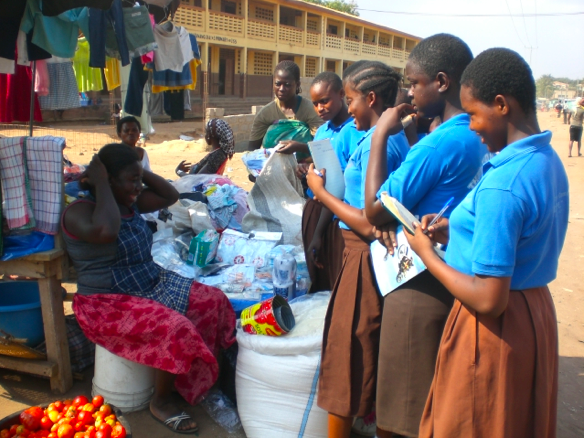 The girls’ decision to visit market women in our local community stems from the fact that the Ghanaian indigenous culture reserves the market place for women to engage in business or trade. The market is basically characterized with buying and selling. On the other hand, modernity, girl child empowerment, and the fight against child labor, are gradually widening the gap between girls and the market setting. The girls club in Madina, however, believe there is still something to be learned and explored in the market. *To find out what challenges individual women in the market face in trading their specific foodstuff or products. The girls were very happy to for such an opportunity to learn about the operations of the community market from the women. They promised to visit the market again! The entry below is shared by our Girls LitClub facilitator in Accra, Ghana, Emefa. 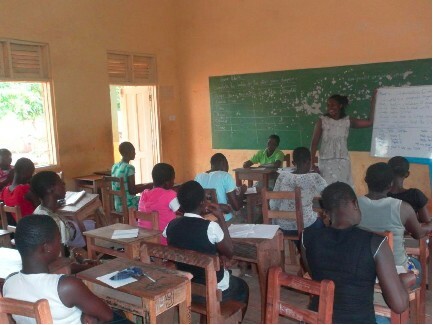 Our Girls LitClubs there is done in partnership with Ceinode Ghana. Thank you for your work, Emefa! The day began with the “Hello Song” that got the facilitator greeting all girls in a very exciting and sisterly environment. Girls could not hide their excitement and anxiety as they sang along with the facilitator to open the day. Next was the check in question that got the girls sharing their most exciting moment of the week. The next activity took the girls through the seven strengths of Litworld workshops. Girls were guided to appreciate what each strength stands for, and why our weekly workshops will be structured around the strengths. The discussion subsequently led girls to indicate what each strength means to them as they came forward to indicate it in words, phrases, sentences and sketches, linking what they had to write to the particular strength being discussed at the time. The chart with the seven strengths boldly hangs in front of the club. Generally, the day was a very interactive and fulfilling for the girls, a very successful and impactful day! The day ended with a quick review of activities for the day and the goodbye song.